Dining is served buffet style. Meals include homemade breads, soups, salad & fruit bar, and dessert. There are two historic dining areas, each accommodating up to 176 individuals. There is also a Lakeside Dining Room overlooking Pinecrest Lake, accommodating up to 120 individuals. A new dining hall used by BRBC Family Camp accommodates up to 400 individuals. Click here for more pictures of the dining hall. There are several two-story Alpine lodges with up to 20 large rooms, 10 on each floor. Each room can sleep a family of 6, with two rooms housing up to 9. The individual rooms contain one queen bed and four or seven single wooden framed bunk beds. The rooms are carpeted with a sink, mirror and electrical outlets. Many of the rooms have connecting doors which will allow you to be close to your friends and family. The lodges have two centrally located bathrooms on each floor. Each bathroom contains three toilets, sinks and mirrors, three private showers and a semi-private dressing area. Bathrooms on the lower-level are handicapped-accessible. 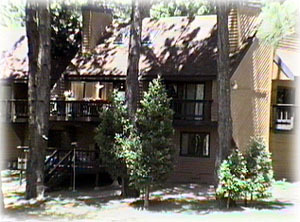 Each floor of the lodges has a large open with many windows, a fireplace, tables, and chairs. Campers use these spaces for classes and fellowship throughout the day. The lodges are centrally located near the dining hall, chapel, playground and recreation areas. Click here for more pictures. 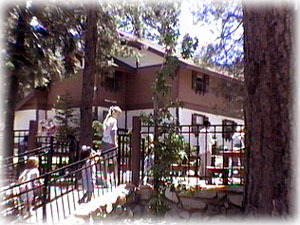 The Pinecrest Suites (a.k.a. the condos) are for adults only (18 yrs and older). The Suites are made up of several three-story chateaus, some with three bedrooms, others with five bedrooms, sleeping a maximum of two persons per room on a queen size bed. Each chateau has a living area with fireplace for small intimate group fellowship. Refrigerators and microwaves are included; however, cooking is not allowed. You will need to bring your own paper goods (towels, plates, cups, etc.). Linens, including towels and washcloths, are provided. The Suites maximum occupancy is 64 persons. Click here for more pictures. There are no allocated RV sites at the camp. 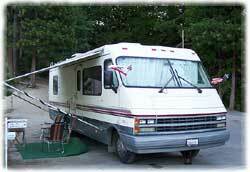 However, the camp allows you to park your RV in the flat asphalt parking area or amongst their apple trees at the entrance to the camp where there is a limited amount of water available.